The dress is beautiful and I love the color. Perfect for my bridesmaids. Highly recommend this seller. exactly as what it described! all my bridesmaids love the dresses so much! hahahaha, so happy! recommend this store!! I bought one dress to try at the biginning, but so surprised that it comed in very fast within 8 days, and all looks so beautiful!!!! all my girls love the dress, and i ordered the balance 8 dresses!!!! thank you and i do recommend this store! thank you! Thank you for the dresses! Tks for the beautiful dresses! shipping is so fast!!! It is increadible, i received all my dresses within 9 days after i placed the order! i do strongly recommend this store!! thank you again! Thank you so much! The service ist just perfect. All my questions were answered quickly. The dresses in charcoal grey look amazing. Me and my girsl: We love this dress! These are amazing quality and fit my four bridesmaids perfectly, they skim over any lumps and bumps they had, I also has them a lot quicker than I imagined!! Cannot wait to use this dress! Beautiful color soft material. I absolutely cannot wait to use this dress over and over. Im so excited about getting a second dress in a different color for a different wedding too! I ordered 5 of these dresses for my bridesmaids after wanting the Two birds dresses but were out of my budget. Not only was the quality fantastic and the shipping fast, but Andrew was prompt getting back to me with all of my questions and reassured me. great fit and fabric, reasonable deliver time. ill be ordering another! Fabulous bridesmaid dresses amazing price very fast delivery thank you. For the price you cant beat the quality. I bought 6 for my bridesmaids and the color is all exactly the same. The customer service was top notch also. 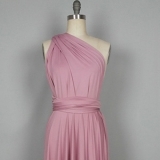 I highly recommend these as an affordable bridesmaid dress! Beautiful dress, will definitely recommend! Shipped on time, bag it was shipped in smelled bad though. Dress was exactly as the pictured showed! it arrived in about 2weeks. These are wonderful! :) very excited for my May wedding! Beautiful dress, very happy with this purchase and perfect color! Great size fit for my curvier bridesmaids! Wonderful. Easy to reach and answer questions in a reasonable time. Wonderful dresses as well. Would def recommend. This seller was great at communication and I received bridesmaid dresses that we all love! Thank you so much! It was fantastic doing business with this seller. Their dresses are so beautiful and high quality. I highly recommend this seller! Perfect, was worried that it might have been see through, but the material is great, theres so much I can do with this dress... Except decide how to wear it on the day!! Fast delivery and great service. Great dress! I love it! Absolutely love the color, fabric and material. I am certain my bridesmaids will look gorgeous on my wedding day. I will be ordering one for myself. Great purchase , arrived punctually. Great dress! Fits any body type!! Beautiful dress! Good material and great quality! So many ways you can wear it, perfect for my bridesmaids. It could be slightly longer on the length, and delivery took slightly longer than stated. But overall great and Im am about to order 5 more! Its beautiful and soft and the fabric is heavy. I absolutely love it. Beautiful dress and fast shipping! Good quality fabric and construction. My bridesmaids loved it! I bought this dress as I am considering them as bridesmaid dresses for my wedding this year but I wanted to see what they are like. The dress is well made and I will be ordering more in different colours. The bridesmaid dress is great . We ordered 1 just to check , fast delivery . Lovely soft lyrca jersey . Ordering 2 more now for my 3 bridesmaids . Love the Idea each girl can wear the dress top to suit each bridesmaid . Wow! I am seriously impressed! Fast shipping, high quality, perfect! The color was a tad bit different than in the picture(I got coral) but that is only because it looks different in certain lightings. I am so happy, and so are my bridesmaids! Love this dress! Perfect for bridesmaids dresses. Very helpful and convenient services. Quick shipping. Will order again and highly recommend. Very nice! Fast shipping. They were very helpful. Would definitely recommend. Its in great shape. Shipping was in good time. Price was perfect. This looks and fits just as described. It came within a week! I was completely blown away with the customer service, price, and shipping time. I would buy this again in a heartbeat. Shipping was good. Girls loved them. My second one so far and love it!